Ah.... so many possibilities. And it's so ea sy to do. 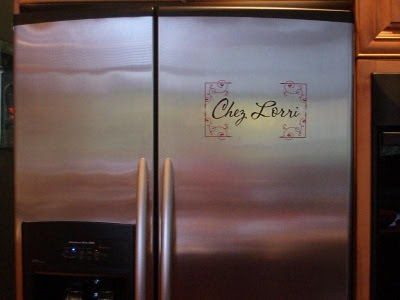 This customer raves about vinyl on her appliances: "Wow, does decaling ever go on nice with stainless steel appliances. Just peels right off, real slick! And you can still clean over them with a damp cloth." Absolutely. I'm thinking washing machine, toaster, oven, curling iron.... okay I know. That's getting a bit carried away. But can you imagine all the fun? I very much like the design you did on the fridge door--looks super legit!